It looks like “Got Milk” got old after 20 years as the tagline for milk marketing nationwide. The iconic advertising campaign was one of the most recognizable in recent history for its use of celebrities and supermodels with milk mustaches on their famous faces. The clever ad campaign gave milk a much cooler image and had everyone uttering, “Got Milk?” But after feeling the squeeze of declining sales and decreased consumer consumption, the Milk Processor Education Program (MilkPEP) has moved on to a fresh ad campaign. AdAge spilled the news, but CNN.com reported on how the industry hopes that the new ads will make milk a cash cow again. The $50 million marketing effort is rolling out now with new ads featuring the tagline “Milk Life,” along with ordinary people praising the protein richness of milk. 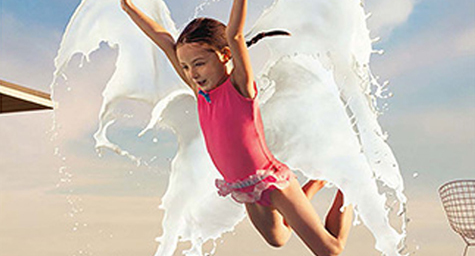 The advertising campaign is designed to show how the protein in milk can power people of all ages through all kinds of activities. “It was time to get consumers to rethink milk,” said Julia Kadison, interim CEO for MilkPEP, which represents milk processors across the country. Over the past two years, fewer consumers have been gulping glasses of milk and many are unaware that the drink is packed with eight grams of protein per cup. As a result, “Got Milk?” got dropped in an effort to refresh the drink’s image. Keep up with the latest trends in advertising. Contact MDG Advertising today at 561-338-7797 or visit mdgadvertising.com. MDG Advertising is a full-service advertising agency and one of Florida’s top branding firms. With offices in Boca Raton and New York City, MDG’s core capabilities include branding, creative, logo design, print advertising, digital marketing, mobile marketing, email marketing, media planning and buying, TV and radio, outdoor advertising, newspaper, video marketing, Web design and development, infographic development, content marketing, mobile marketing, social media marketing, and SEO. For more on the latest trends in branding and advertising, contact MDG Advertising today at 561-338-7797.